It’s the Year of Adventure here in Wales and there are lots of exciting events taking place. On 2nd & 3rd April it’s the Great Weekend of Adventure so wherever you are in Wales there’s likely to be something happening nearby. 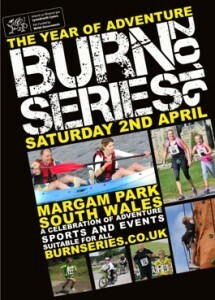 On Saturday 2nd April, I’ll be at Margam Park in south Wales for the Burn Series. 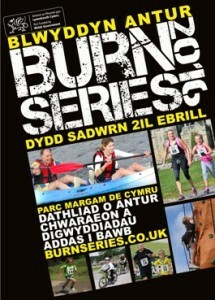 The main events are two Burn Series adventure races. These are run, bike, kayak challenges that are suitable for teams, individuals and all the family. You can choose from the miniBurn (3km run, 1km kayak, 10km bike) or the more challenge BURN (10km run, 1km kayak, 40km mountain bike). So go on, set yourself a challenge, no excuses! For supporters and spectators, there will also be a whole host of events and activities celebrating adventure, including Josh Briars the pro Flatland BMX Rider performing his tricks, a talk by Adventure Racing World Champion Nick Gracie, bushcraft demonstrations with Dryad Bushcraft and musical entertainment from local band, The Broadcasts.